346: High Protein Low Carb Vegetarian (my day on a plate). When it comes to vegetarian eating there are a lot of misconceptions. One: Void of many vital nutrients and a poor source of protein. Three: Tedious and time consuming. Of course all this can be true. However it can also be true with any approach to eating. One of the super fab things about a vego diet is that it forces you to consider every thing you consume. As a meat eater everything is fair game. The stodgy pizza… the dodgy pies… however when you’re vego you’ve got a pretty handy excuse to politely decline a poor food choice. It’s also a reason to STOP and think before you mindlessly demolish. High Protein Low Carb Vegetarian. I’m going to put the steps, the macronutrients (so that’s Carbs, Proteins and Fat) and the vital micronutrients that can often be lacking in a vegetarian diet into a day of meals. Pretty much my day of meals in fact. I’ll also take care of those commonly held boring-bland-tedious-time-consuming misconceptions too. Let’s recap those commonly lacking nutrients and then as we proceed through my day on a plate I’ll show you how I include each of them. (in the 339 show I share breakdowns for different ages and for males). 4-7 MICRO-grams of Vitamin B12. 500 – 1000 milligrams of Omega 3. Oh, and then of course there’s: PROTEIN. I’m a fan of 1-1.5 grams of protein per pound of your lean body mass. So to be clear we’re not looking to eat for total body mass including fat, just for your lean mass. I discuss How Much Protein Do I Need To Eat in the #050 show however if you just want to keep it super simple? 100 grams of protein a day is a great starting point. Before we get rolling here are 3 considerations that make healthy vegetarian meals as simple, easy and sustainable as possible. Now these considerations are not necessary at all. There are limitless effective eating approaches. If you LOVE to spend time in the kitchen you might want to eat a vastly different meal every single meal and you can absolutely do that healthily. It’d just be way too much of a massive time eat for me! A). Aim for slight variations of your 3 main meals. B). Be committed to preparing meals on mass. C). Choose one ingredients foods as a priority. Onwards with meal one: BREAKFAST. I’m currently enjoying a green smoothie for the first meal of the day. I have this Mon-Sat. Similar each day in that it’ll be mostly leafy greens, with a minimal amount of fruit and a scoop of protein powder however it’ll vary based on what is looking good / good value at the markets. Also what I got in my organic veggie box. And finally, how the rest of my day is looking. Today was, a big handful of kale, a big handful of spinach, half a small cucumber, a good half a teaspoon of Spirilina, 50-100 grams frozen blueberries and raspberries and a scoop of raw vegan brown rice protein powder. Mixed with water. It’s mixed with water however I have almond milk in my first of 2 coffees and then I might have another 225 mils in a mug of hot almond milk later in the day. => It’s chocka full of micronutrients – it’s also got protein in the form of protein powder and the nuts. Other protein options are a egg white or 2 and a tablespoon of hemp or chia seeds. If I knew I wouldn’t get morning tea and/or lunch was going to be lighter than normal I’d add an extra scoop of protein powder, a tablespoon of hemp seeds, an egg white or 2 and 1/4 avocado to my smoothie. I’ve gotten a good start on my IRON. The 3 grams / a good half a teaspoon of Spirilina contains 1.33mg. 60 grams Cashews contains 3mg. 1 cup Raw Spinach contains 1.2mg. Moving onto CALCIUM. 1 cup Kale contains 180mg. 60 grams Cashews contains 27mg. That almond milk I mentioned in the coffee and I’ll also count the cup I have of it later in the day equates to around 250 mils and contains 188 mg. So far as ZINC. 60 grams Cashews contains 3.8mg. => It’s never boring and bland. You can get as creative as you like with a smoothie. Pretty much anything goes… my mum loves garlic in her smoothies though I’m not sold yet. Nut butter is a winner if you can keep it in the house. i really like a lot of green goodness sweetened with a touch of fruit and a protein powder you love. For creaminess try 1/2 a frozen banana or 1/4 avocado. => I fast-track tedious and time consuming by preparing my smoothies on Sunday. So I’ll mix fresh produce for Mon/Tues and store them in the fridge. All I need to add is water. I’ll bag frozen produce (or use fresh and freeze it) for Wed-Sat. I really enjoy a HUGE salad for lunch. Because I make mine at home it’s a mix of fresh leaves and other raw veg and also baked veg. My salad always has well over a dozen dif veg. Again it’ll be based on the produce that’s looking good / good value / in my organic veg box delivery. Today was, a couple of cups of spinach and rocket and swiss chard. Also fresh spring onion, red onion, red capsicum, tomato, asparagus, carrot, beetroot, basil and 1/4 of an avocado. I then added cooked veg: a cup of broccoli, 1/2 a brown onion, 1/2 a zucchini, 100gm mushies, a couple cloves garlic with 1 heaped tablespoon of dairy free basil pesto stirred through after cooking. I dumped cooked over fresh added some balsamic and finished with a couple of good tablespoons of my zucchini hummus. I’ll link to my hummus recipe in the show notes. For additional protein besides just the hemp seeds and tahini in the hummus I follow lunch with protein pancakes. Again I’ll link to them however protein wise they involve, 4 egg whites and a super heaped scoop of protein powder. Instead of those protein pancakes I now follow lunch and dinner with a mini dessert of 1 tablespoon of chia seeds + 100 ml almond milk + a scoop of vegan protein powder… all blended with 3 ice cubes in the nutribullet. Before we check out a break down of lunch I should say by now I’ve also had my second and final coffee of the day. It’s a large long black. More on this later. I’ve also had a protein shake after training. Just one scoop of raw vegan protein powder mixed with water. => With 12+ different veg again it’s chocka full of micronutrient. It’s also got a heap of protein in the form of egg whites / protein powder and the hummus with it’s tahini + hemps seeds. Other protein options if you’re not at home to eat protein pancakes? I’d sprinkle a tablespoon of hemp seeds and/or pumpkin seeds over a cafe salad. Perhaps also another 50 grams of nuts. If that salad didn’t include substantial protein, like an egg or fish I’d also follow it with a protein shake mixed with water. So far as IRON. 2 cups Raw Spinach/Chard/Rocket will give me around 2.4mg. So far as CALCIUM. 1 cup Broccoli contains 95 mg. 2 cups Raw Spinach/Chard/Rocket will give me at least 350 mg. 1 tablespoon Tahini contains 65 mg. So far as ZINC. 1 cup cooked Broccoli contains 0.8 mg.
Let’s talk OMEGA 3’s. 1 tablespoon Hemp seeds contains 1000 mg. That’s my day sorted. When I’m not eating fish and right now I haven’t touched it for a couple of months… I’ll make sure I get a tablespoon of hemp seeds a day. Either in a smoothie, in a salad, in an omelette or as in this case I make a batch of hummus to last 6 days and add 6 tablespoons of hemp seeds to it. => Regarding boring and bland? Like the smoothie anything goes in a salad. I love the pesto and the hummus for flavour. I also like a variety of textures and cooking methods. Baked veg like mushies and sometimes even crispy brussels adds another dimension. Herbs like basil or coriander are also fab. Finally the better quality your produce and the less dulled by fake processed foods your tastebuds are the more delicious your salad will taste. => Outsmarting tedious and time-consuming? Although I generally stick to unwashed organic veg which IS time consuming your fast-track is premixed and washed bags of salad greens and also frozen veg. My time saver is to prepare meals on mass so I’ll prepare 3 salads at a time. I also save lunch prep for when I need a break from work and listen to a podcast while I do it. At this point we’re 2/3’s of the day through my meals and as the show is getting long I’ll leave dinner for the Wednesday show. Before we get actionable though I’d like to touch on the coffee point I mentioned earlier. One of the recent upgrades I’ve made to my nutrition is cutting back from 5 coffees a day to 2. It’s actually been a bit of a keystone habit in that it’s helped me with a number of other positive habits / outcomes. As I share the surprise benefits of cutting back the LIQUID GOLD I’d love you to start to think of the ONE food upgrade you’re up for implementing this week. So, I cut back coffee purely because I felt out of control. Not shaky or anxious… just like it was a massive addiction in control of me rather than the reverse. I felt like I walked around with a coffee cup attached to my hand! Not surprisingly: I’m sleeping better and I’m saving a lil cash-o-la. In addition: I’m drinking much more water and consuming much less Nativa (artificial sweetener). Even better: I just feel more congruent in that I’m in control of my liquid gold intake rather than hopelessly at it’s mercy. Back to YOU. To get actionable today, what is the ONE food upgrade you’re up for implementing this week? I hope you can join me then for: My Day On A Plate (Part 2). 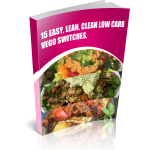 Grab my Free e-Book: 15 Easy Lean, Clean LOW CARB Vego Switches! Since it’s no fun just eliminating something you love – and NOT sustainable – here are 15 delicious alternatives to enjoy instead. Recipes like: Kale-Cauliflower Tabouli with Zucchini Hummus / Eggplant Cannelloni / Kale Crisp Nacho’s. If you’re yet to share the Healthification love – just click here to zip over to iTunes and leave an honest rating and review. It’d help me out big time. With gratitude, Kate. "Discipline is just choosing between what you want now and what you want most. " 100% Backing YOURSELF trumps any quick-fix-over-promising-hope-eroding-MYTH!